During the last two months, Jesse and I have explored several trails from our handy trail running book. From familiar singletrack and uncharted territory during the North Face Endurance Challenge 50K to the unlikely tranquil wilderness in Oakland’s Redwood Regional Park and our hangover-less New Year’s Day summit of Mt. Tam’s East Peak, we’ve ran beautiful, new-to-us routes. With so many preserves and parks in the Bay Area, we’ll never get bored. This weekend, we’ll likely embrace our city’s trail options: Land’s End or the Presidio. These routes are perfect ways to escape from the city’s hustle and bustle without ever leaving (and seeing the Golden Gate from different viewpoints is cool, too). 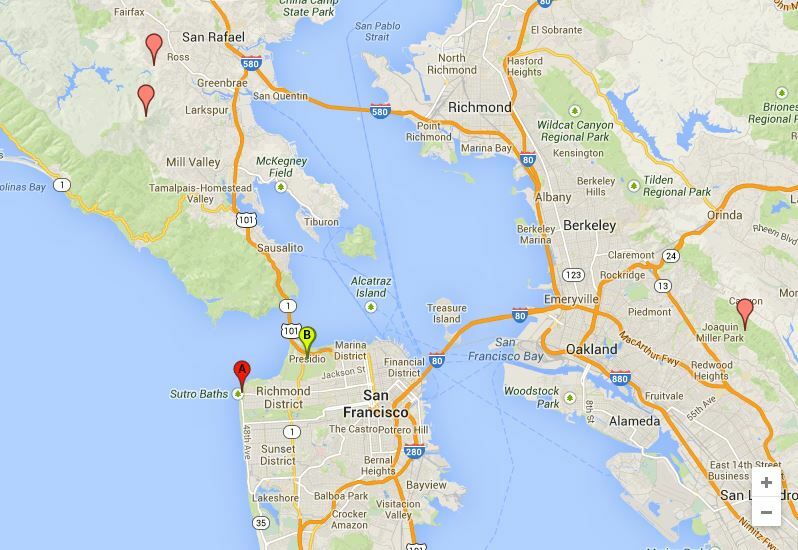 Here’s a map of our recent trail run locations (in red) and our weekend prospects.